The 2016 International 14 Worlds are a wrap! 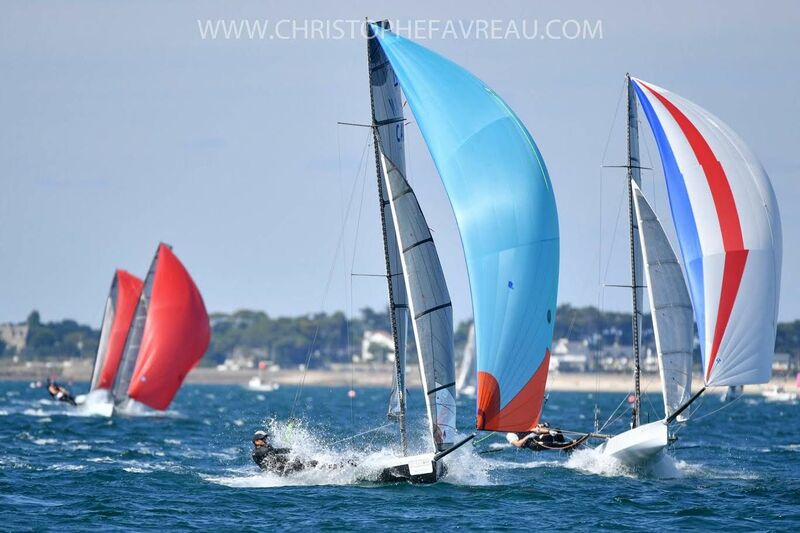 The two week event closed off yesterday in Carnac, France finishing with the 7 race individual World Championship sailed over 8 days and was marked by absolute perfect skiff conditions. Most days started out looking light, but the breeze always came in and most days were sailed finishing in 12-16 knots of full on flat out twin wiring conditions. We saw one day that was a bit heavier hitting 20 knots, but even that day was a full press day with not many backing off the gas pedal. The water was fairly flat for the most part – a bit of weed a times, and the temperature felt like home. Add all of this up and land it in an absolutely gorgeous French seaside town stocked with great wine and food and I don’t think you could get more champagne of conditions in a champagne locale. Most of the 14ers I spoke with said this was one of the best week long conditions for a Worlds that we have seen in quite some time… It wasn’t light and it wasn’t so heavy that the boats saw many breakdowns. The YC de Carnac did a great job running the event and big thanks to them and all of the organizing staff. This is a large club fully focused on sailing, and with a major focus on cats and other fast boats. Very impressed with their junior program – the French apparently get really good at sailing because they sail all the time – go figure. The Club and organizers hosted 3 large multi-course dinners over the event – including one that served up massively stacked platters of all things French seafood – yes that was escargot! – but they also learned after the first night to cut the 14 fleet on the beverages after a certain point. The French 14 class put on a great bbq at the club another night and the local restaurants and bars were full most others. Everyone was great and can’t say enough good things about the entire Brittany region of France. The 14’s are getting faster – these skiffs are incredible 2 person rockets – and we are seeing new designs come in and new systems, foil shapes and different technology being used on the boats. That being said we are also seeing 12 year old designs winning races at World Championships raced by solid sailors who know how to make these boats take off. Glen Truswell and Sam Pascoe won the event and their 2nd World Championship by a good margin, but it wasn’t a given – with 4 other boats taking some races. Roger Gilbert and Ben McGrane were 2nd; 4X World Champ Archie Massey with Harvey Hillary took 3rd and rumor has it Archie’s got a new rocket currently being built in the shed. Mark Kristic & James Lanati out of Black Rock were the top Aussie team in 4th and Katie Nurton was the first female taking 6 with madman Nigel Ash pulling the strings. See full results here. All in all Team GBR has kept their dominance in the 14’s, but the Aussie teams are pushing them and everyone in the fleet is getting faster. Team Germany had 3 boats in the top 20 with crowd favorites Georg Borkenstein & Eike Dietrich in 12th. The US contingent had 2 boats cracking the top 20 with Brad Reutenik and ‘Down Town’ Garrett Brown taking 18th. The results show that the North American teams need to get on the jump – All are showing really good speed at times, but the more we sail in big fleets and sail against top talent we’ll all get better. The size and talent of the GBR & AUS fleets have proved that correct – lets hit the pace and keep it together. Sailing fast and sailing hard are what the 14’s are about – hitting 12’s upwind and 20’s downwind while having a blast off the water with your best friends from around the world makes these events really special. Archie Massey this week referred to the 14 as the Ferrari of skiffs – and they take a skilled helm and crew to drive it well, but its the people and camaraderie of the fleet that keeps everyone coming back. After 6 worlds now – there’s no time to slow down… August 2018 is the our next World Championship and its going to land on San Francisco Bay hosted by Richmond YC. Lots of time to get in the class, but get going now – and you Camera boats will want to mark your calendars for this one.